Closest View Yet of Anchiornis "Near Bird"
More than 225 fossils of the Late Jurassic feathered dinosaur Anchiornis (A. huxleyi) have been found to date and this relative abundance of fossil specimens in conjunction with some very sophisticated laser technology, has enabled scientists to gain the best idea yet as to what dinosaurs actually looked like. Anchiornis huxleyi fossils come from the Tiaojishan Formation of Liaoning (China) and the dinosaur’s name means “Huxley’s near bird”, honouring the 19th Century English scientist Thomas Henry Huxley, an early supporter of Darwin’s theory of evolution, and one of the first academics to propose a close evolutionary relationship between the birds and the Dinosauria. How apt that the use of a relatively new technique in palaeontology, that of the production of laser-stimulated fluorescence images, has enabled palaeontologists to get closer to “near bird” than ever before. An illustration of Anchiornis huxleyi. Writing in the journal “Nature Communications”, researchers from the University of Hong Kong in collaboration with scientists from Linyi University (Shandong Province), the Chinese Academy of Sciences and a number of American research institutions, report on the reconstruction of a feathered dinosaur’s body outline based on high-definition images of preserved soft tissues and their integumental covering. Reconstructed body outline of the bird-like feathered dinosaur Anchiornis using laser-stimulated fluorescence images. The coloured areas represent different fossil specimens and the black areas are approximated reconstructions. For the first time palaeontologists have an accurate body outline of a bird-like dinosaur. The scale bar in the image is 1 cm and the body length of Anchiornis (head to tail) is approximately 40 cm. Laser-stimulated fluorescence (LSF), is a revolutionary new technique using high power lasers that makes unseen soft tissues preserved alongside the bones, literally “glow in the dark” by fluorescence, until the application of this new technique, palaeontologists had to infer body plans based on the fossilised bones and evidence of muscle scars using extant animals as comparisons. One of the corresponding authors of the scientific paper, Dr Michael Pittman (Department of Earth Sciences, the University of Hong Kong), explained how he and his co-workers reconstructed the first highly detailed body outline of a feathered dinosaur based on high-definition images of its preserved soft tissues. The wing of the bird-like feathered dinosaur Anchiornis under laser-stimulated fluorescence. This ground-breaking research has helped palaeontologists to see just how closely, Anchiornis of the Late Jurassic, resembled modern birds. For example, in the image above, folds of skin in front of the elbow and behind the wrist (referred to as a patagium), can be made out. 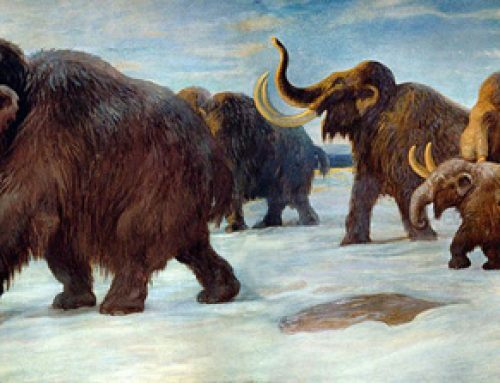 The patagium was covered in feathers, just like in modern birds. The laser-stimulated fluorescence method was developed by collaborator Tom Kaye (Foundation for Scientific Advancement, Arizona, USA). The technique involves scanning fossils with a violet laser in a dark room. The laser “excites” the few skin atoms left in the matrix making them glow, revealing what the shape of the dinosaur actually looked like. 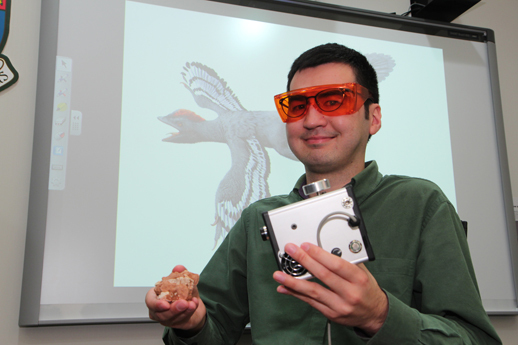 Dr Pittman holding the laser scanner pictured behind is an illustration of Anchiornis. Dr Pittman and his colleagues examined over two hundred specimens of the feathered bird-like dinosaur Anchiornis to find the dozen or so that showed special preservation. The quantitative reconstruction that the team developed shows the contours of the wings, legs and even perfectly preserved foot scales, providing new details that illuminate the origin of birds. It seems that Anchiornis had “drumsticks” just like a modern bird too. 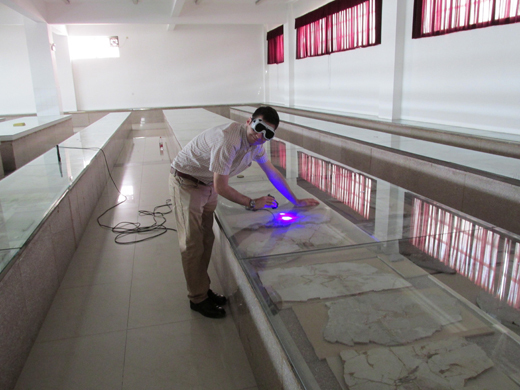 Dr Pittman examines fossils using LSF in Shandong TianYu Museum of Natural History. When first described in 2009, Anchiornis was heralded as an important transitional fossil between feathered dinosaurs and volant (flying) forms. Using this new technique (LSF), Dr Pittman and his colleagues found that the shape of wing was in many ways similar to modern birds, but it also had some seemingly primitive characteristics like feathers arranged more evenly across the wing rather than in distinct rows. This research suggests that Anchiornis could produce a relatively straight arm, a posture broadly found in many living gliding birds (for example, Cormorants, Albatrosses and Pelicans). The research identifies a previously unknown aspect of arm morphology differentiation at the earliest stages of paravian evolution (at least by the Oxfordian stage of the Late Jurassic), that may even have been widespread. These new insights provide crucial information for reconstructing how dinosaurs experimented and eventually achieved flight. Dr Pittman holding a drawing and a body plan of Anchiornis. The scientific paper: Wang, X. et al. “Basal Paravian Functional Anatomy Illuminated by High-detail Body Outline” published in Nature Communications (Nat. Commun. 8, 14576 doi: 10.1038/ncomms14576 2017). Everything Dinosaur acknowledges the help of Hong Kong University in the compilation of this article.